I popped over to the Heard Museum today. It's a museum with Native American art and exhibits focusing mostly on the SouthWest. I've been meaning to go here and actually come down here during the World Hoop Dancing championships in February. And while it would be cool to compete, you have to be Native American to do it (no matter how good you can dance). 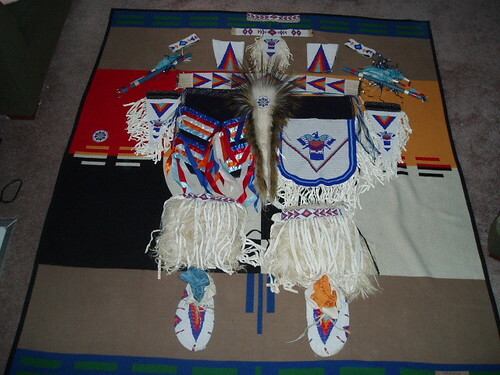 My little secret about doing Ironman races is to actually get into dance shape so that one day, once I have all my beadwork, featherwork, and dance clothes all ready, I can take a year off, strut my stuff, pop over to all the big Pow Wows like Denver March, Stanford, Gathering of Nations, Red Earth, United Tribes, and finish off at Schemitzun. It's looking like that's not going to happen until I'm 35 but probably 40 or 50 at this rate with work. Just one year, dance my heart out, and have everyone who was there wonder "who was that…" or "remember that dancer…". Dreams are neat to hold on to and the Heard Museum was pretty cool. 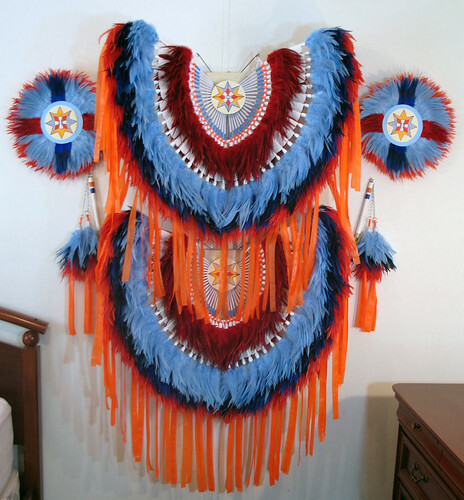 UC Berkeley Pow Wow is this weekend, April 7 – 8 from 11am to 7pm. I'm guessing Grand Entry is at Noon or 1pm. Going to swing by for an hour or so, grab some fry bread and bounce. Should be fun. Grand entry video from last year's pow wow. I looked up roach on the various search engines and all I got was Papa Roach, Roach clothing, and cockroaches. Not a peep about porcupine hair roaches not even on Wikipedia. That's awful. Here's the history of the porcupine roach which is a Native American headdress made out of porcupine guard hair and deer hair. Sometimes roaches are made out of skunk hair (instead of deer hair) and I've heard the very early ones were made out of turkey beard hair. Porcupine roaches are what essentially every modern Native American pow wow dancer wears on their head, except for the women and not all Southern Straight dancers (who wear a hat made out of otter fur). Most roaches are between 15" and 24" long, mine is 24". 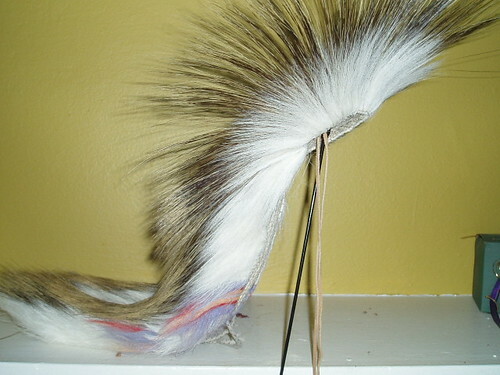 It's broken down like this, an inside layer of deer hair, a main row of porcupine hair, another row of porcupine hair in the front, and then a layer of deer hair on the outside. Traditional deer hair colors are red all around or white all around but modern roaches have some bits of color on them. Roaches cost about $300-$500 or $75+ for a roach kit. I've made two roaches, one I still have and one that was 15" that I sold a long time ago. They take forever to make. The hardest part is sorting the hair. You have to sort the hair in .5" groupings from 5" all the way to 11" – that by itself could take you a week to do. Probably takes a month to build out a roach. To put on a roach the right way, you have to have long hair. You take a braid of your hair, put it through the hole in the roach, and secure the roach down with your hair and a roach pin. I'm talking about a different roach pin…I don't have long hair so I use leather laces. The finishing touch to the roach is a couple of eagle feathers secured via a spreader. The spreader is supposed to spread the roach hairs so that it fans out and looks cool, versus sticking straight up and looking not so cool. So that's a porcupine roach.